For sewing medium to heavy weight materials such as denim and other heavier weight fabrics such as canvas, soft leather, vinyl, and webbing. Suitable for sewing such products as jeans, hand bags, belts, wallets, book covers, webbing straps, canvas bags and covers, etc. High Speed, Single needle, Top and Bottom Feed with Walking Foot (Not a Needle Feed), Reverse, Adjustable Stitch Length up to 8mm, Ideal Thread Sizes from TEX 40 to TEX 138, Automatic Lubrication with Oil Pan and Oil Pump. 1. What exact class is this machine? 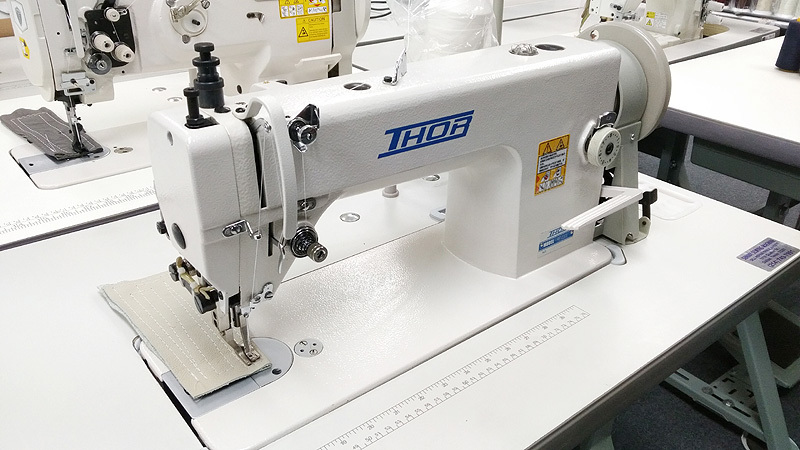 - This machine fits in between a standard lockstitch machine (like this JUKI DDL-8700) and a true compound walking foot machine (like this THOR GC-1541S). The RE-0302 is a walking foot machine with top and bottom feed, but not a needle feed. 2. Is this machine adequate for automotive & marine upholstery? - No. For these applications, you will need to step up to a compound (triple) feed machine that has the needle feed function like the THOR GC-1541S. 3. What will this machine sew well? - Anything that is considered medium weight to medium-heavy weight materials such as denim, canvas, vinyl, soft leather, and webbing. Great for making belts, wallets, book covers, hand bag straps, leather and canvas bags, watch bands, low ply webbing straps, etc. 4. What size bobbin and needles does this machine have? - This machine has a BIG Hook and Bobbin (Size "M") and takes Needle System 135x17, Sizes 16 to 23.